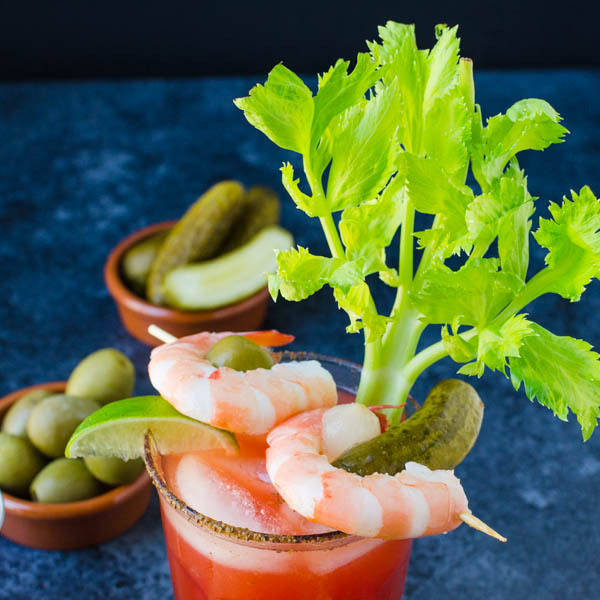 A delicious twist to your standard Bloody Mary recipe, this Clamato Bloody Mary is rimmed in Old Bay seasoning and tasty Bloody Mary garnishes. For the uninitiated, Clam Juice + Tomato Juice = Clamato. To me, it’s like a thinner version of V-8 with a hint of the sea. Not overly fishy at all and very much at home hanging out with vodka and spice in an ice filled glass loaded with chunky garnishes. Clamato Bloody Mary is a delicious departure from the usual. Too often, I get stuck in a brunch cocktail rut. My go to is usually a mimosa or some variation on one and while Scott prefers Bloody Mary’s, he won’t turn down a prosecco spiked fruit juice if it’s being offered. 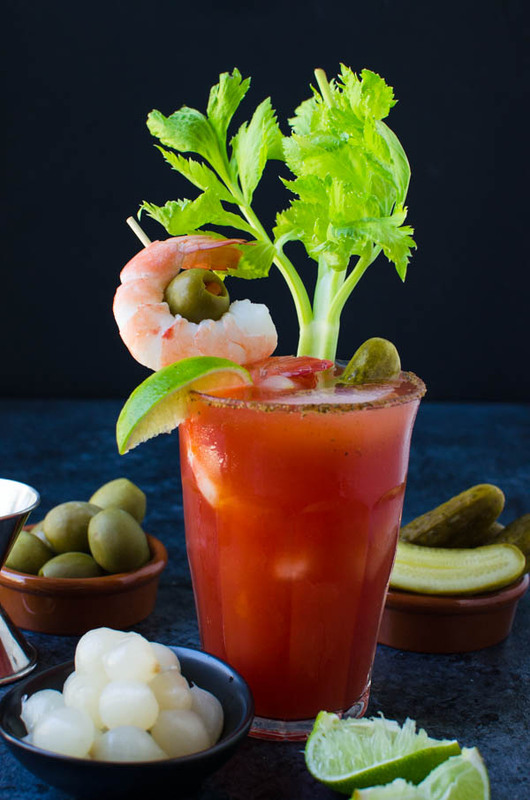 Clamato Bloody Marys have many of the same features as a regular bloody, but the Old Bay seasoned rim and poached shrimp garnish set it apart from your everyday brunch cocktail item. 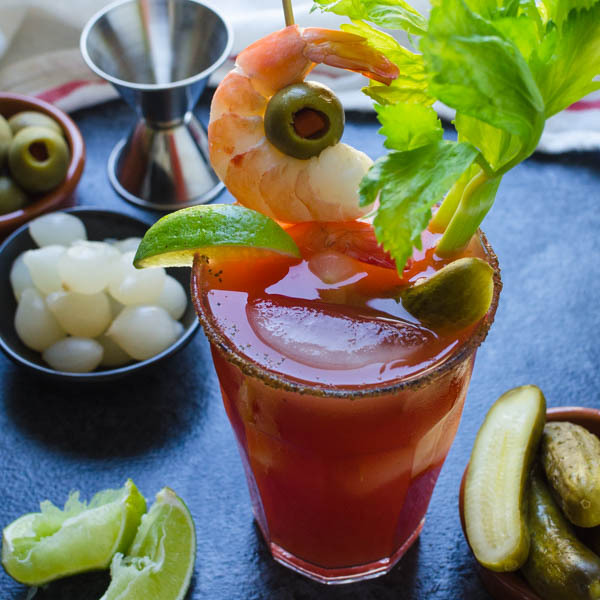 Clamato Bloody Mary Garnish – Options Galore! 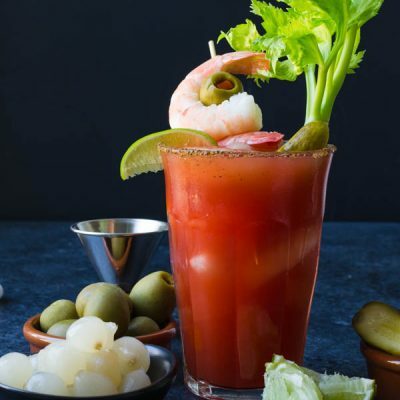 The Bloody Mary garnish has taken many forms, from a simple celery stick to the outrageous creations touted by bars and restaurants around the country. To pack people in on a quiet Sunday, they construct a gravity defying scaffold of everything from full on cheeseburgers, pizzas and even deep fried chicken — not a drumstick or wing — a chicken. My assorted offering may pale in comparison, but come on, are you gonna deep fry a chicken just to impress someone at your weekend brunch? 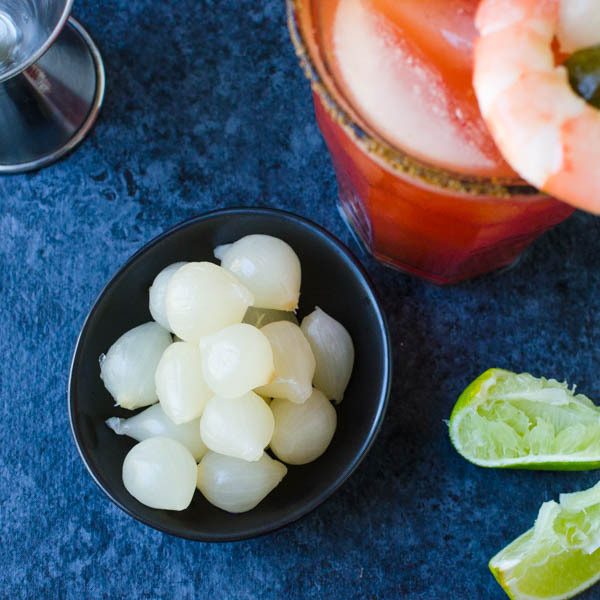 I figure quick poached shrimp and an assortment of pickles, onions, olives, celery and lime make a pretty solid statement and elevate this classic brunch cocktail at home. I prefer really large pimento stuffed olives, but almond stuffed or the ones filled with blue cheese are equally good. Small-ish dill pickles or French cornichons are great additions and you may also enjoy cubes of cheddar, provolone or cheddar jack. I’m not as crazy about cheese and seafood together, but if you are — go for it! The showstopper here are the extra-large shrimp, preferably fresh, not frozen. 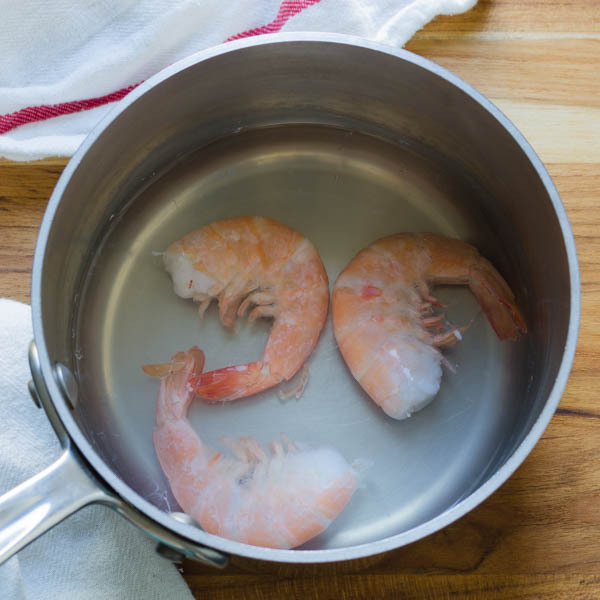 (I only made 3 because I put this post together at 9 a.m. on a Monday morning with no one to help me drink…) To poach them, bring a pot of salted water to a boil, drop in the shrimp, cover and remove from the heat and let rest for 2-3 minutes until the shrimp are snappy and cooked through. Then peel the legs and shell off, leaving the last knuckle and tail still attached. I recommend using extra long picks to hold all the garnishes and preparing the garnish BEFORE you assemble the Clamato Bloody Mary because it comes together fast. I used simple bamboo skewers to build my garnishes — and if you’re creating a Clamato Bloody Mary bar for a special brunch, assemble garnishes on the skewers before your guests arrive and maybe make several different versions to account for different tastes. Make several pitchers of Clamato Blood Mary’s the night before and refrigerate them overnight. 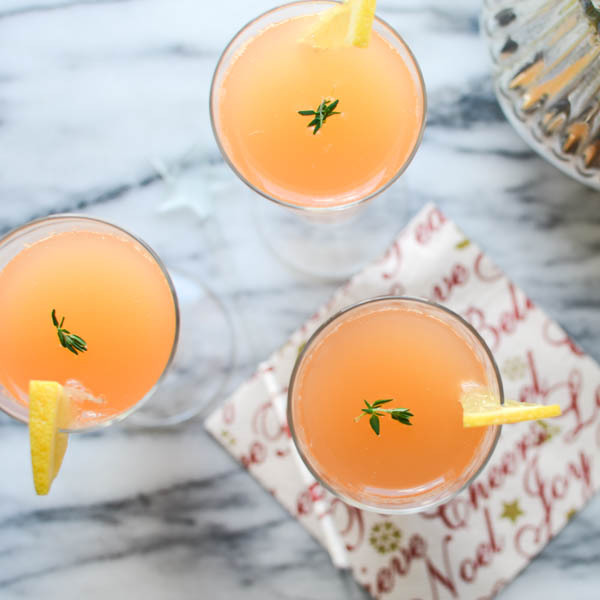 Since you’ve done most of the heavy lifting, it’ll just be a matter of pouring and garnishing for individual guests. 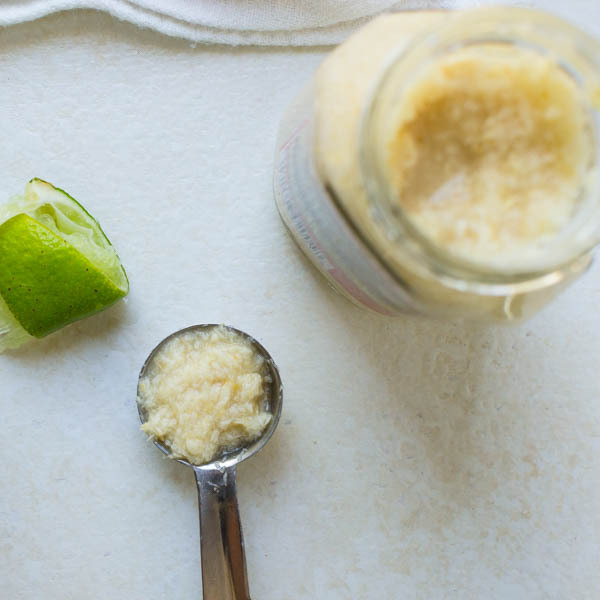 Keep the vodka, hot sauce, horseradish and additional sliced limes on the bar so friends can add more of their favorites to suit their tastes. Now the only question is what’s on the menu at this shindig? Since we’re in a seafood theme with the cocktail, how about this quiche or these crab cakes or maybe ceviche, even a frittata? Whatever you decide, I’m sure it’ll be good! A standard bloody, taken up a notch. Make it as spicy as you like! 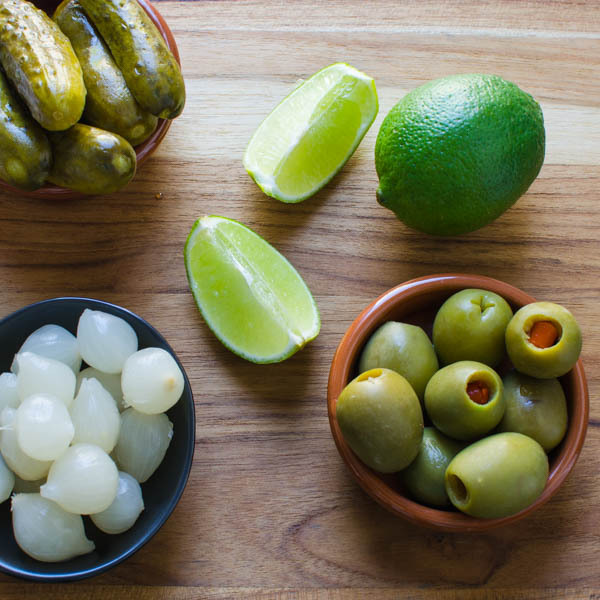 Assemble your garnishes by threading them onto the skewers. Chill until ready to serve. 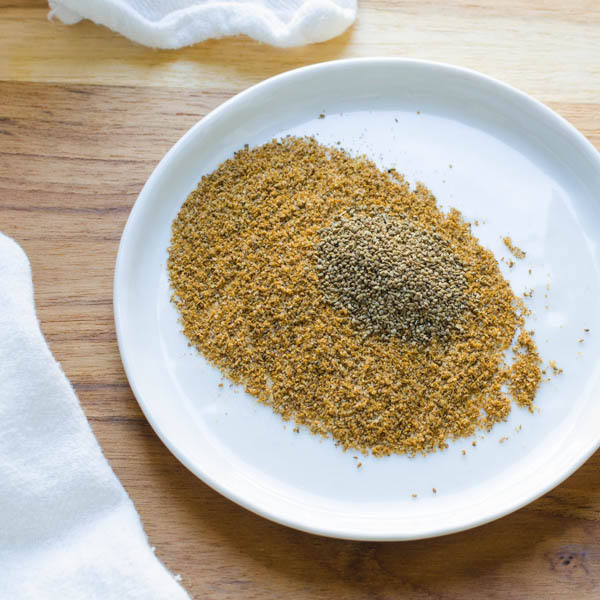 In a small flat plate, combine the Old Bay seasoning and celery seed. 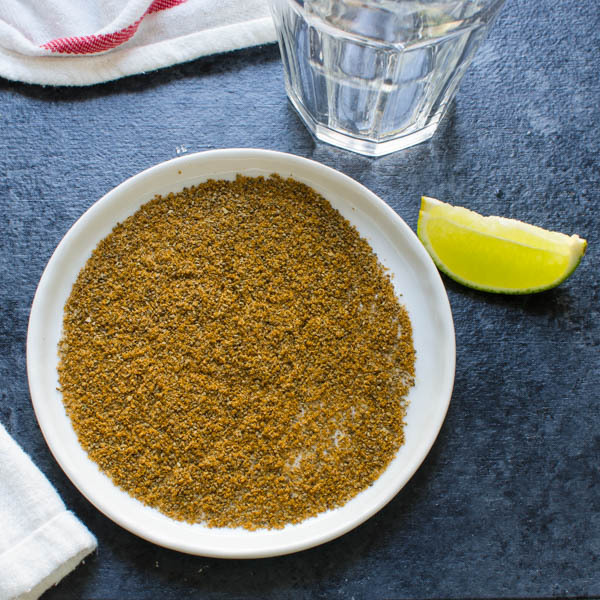 Shake the plate slightly to spread the seasoning into an even layer. 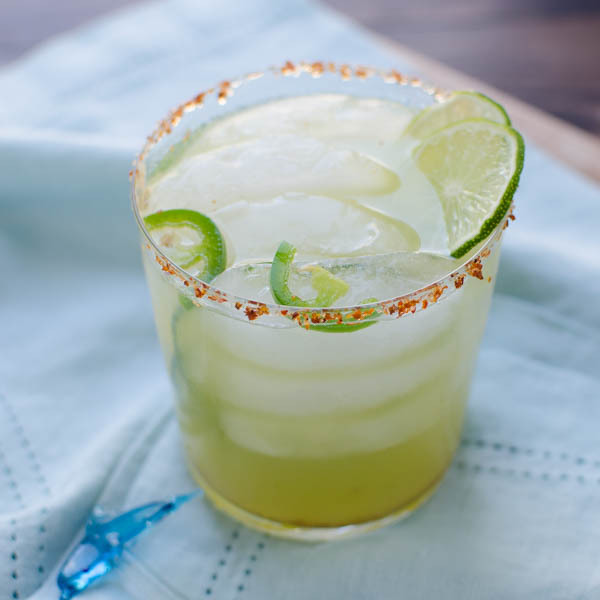 Rum a lime around the rim of a highball glass. Turn the glass upside down into the seasoning until the rim is coated. Set aside. In a Boston Shaker, combine the vodka, clamato, worcestershire, horseradish (if using) and lime juice. Add ice cubes, secure the lid and shake vigorously to combine. Pour the mixture into the prepared glass. Add a dash of hot sauce and garnish with desired accompaniments. Serve. I don’t even remember the last time I had one of these. I think this weekend for Mother’s Day this just might be on the menu for hubby to make me!! Can I say that I’ve never made a Bloody Mary? Yours looks so easy to make and packed with flavors! Such great pics too!! 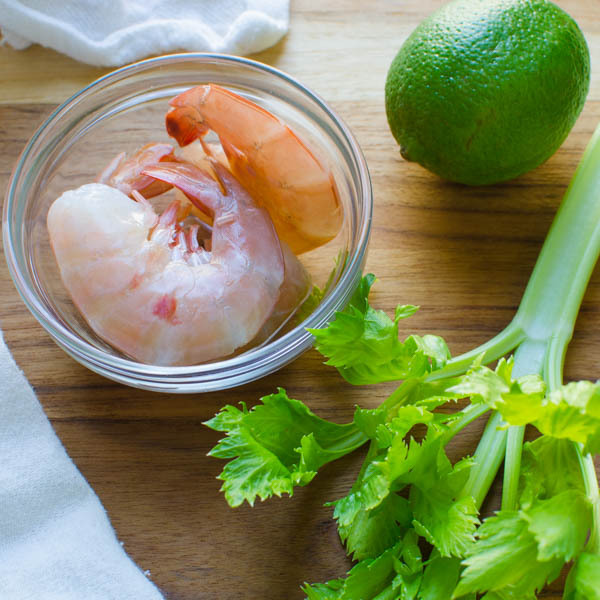 Rimmed with Old Bay and garnished with shrimp? That sounds like my kind of drink!